This tutorial will show you how to easily install and configure a PPTP VPN server on a cPanel (RHEL/CentOS) server. A VPN server can be used to access geographically restricted websites if your cPanel server is located in a non-restricted country. Also you can use it to encrypt your data connection between your computer and cPanel server if for example you’re connected to a public WiFi hotspot and want to visit your web-banking account. The two packages needed to setup the VPN server are ppp and poptop. Go to http://poptop.sourceforge.net/yum/stable/, select rhel5 or rhel6 and i386 or x86_64 depending on which RHEL/CentOS release/architecture you have running on your cPanel server, and copy the URL to the pptpd rpm. In my case I was running CentOS 5.6 x64 so I used pptpd-1.3.4-2.rhel5.x86_64.rpm. When poptop has finished installing, open the file /etc/pptpd.conf for editing. I use nano. Local IP will be assigned to the ppp interface, and the Remote IP range is the range of IPs that will be assigned to VPN clients. Be creative and use private IPs that most probable won’t conflict with any other IPs if you’re in an Internet Cafe, or an airport WiFi. A list of possible IPs to use as well as some more info about numbering private subnets can be found at the OpenVPN documentation here. Next open the /etc/ppp/options.pptpd file for editing. and save/close the file. In my case I used Google DNS, but you can use anything you like ie. OpenDNS or your ISPs DNS servers. Finally open the file /etc/ppp/chap-secrets to add some users. Just change vpnuserX and randompassX to anything you like. Also if your clients have a static IP you can enter it instead of the * so that the particular VPN user will only be able to login from the specified IP. Since you’re running cPanel, you’re most probably running csf. But before we get into the csf configuration, we first need to enable IP forwarding. So open /etc/sysctl.conf and at the very first lines you will see the parameter net.ipv4.ip_forward. Set it to 1, save the file, and run sysctl -p to apply the changes. Now for the csf configuration, we will make use of two files that csf invokes before and after it runs. The two files are called csfpre.sh and csfpost.sh and are located in /etc/csf. If they don’t exist we’ll just go ahead and create them. Finally restart csf to apply the above rules and start the pptpd service. Setting up a PPTP VPN connection is beyond the scope of this HOWTO, but you can read an excellent and comprehensive guide from Paul Stamatiou (@stammy) here. 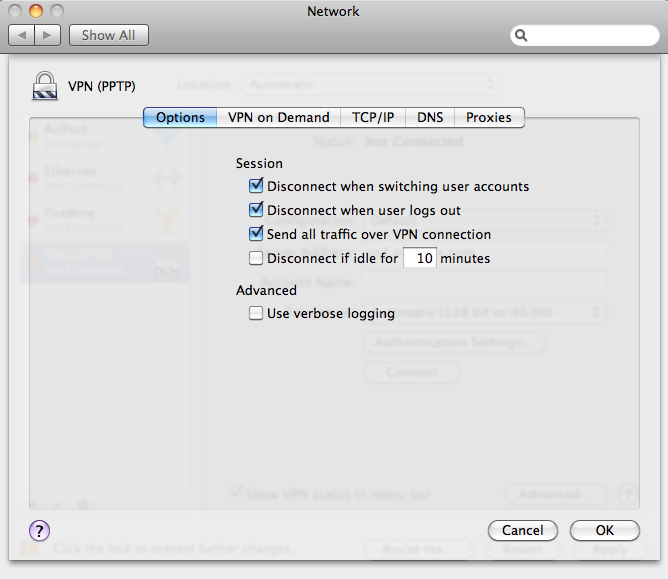 Paul has written step by step instructions on how to setup a PPTP VPN connection on Mac OS X, Windows 7 and Ubuntu. Just remember to use your own VPN server’s IP instead of his ones. Exellent guide, I was looking for a easy way of installing without relying on purchasing cPanel plugins. Greetings from Athens, and excellent guide btw. However, I am facing a rather huge issue. For some inexplicable reason, it seems that there is no authentication process; that is, anyone can connect to the vpn service with blank credentials. I checked all my configuration files and chap-secrets file; everything is as it is supposed to. I am running a 64-bit OpenVZ VPS with Cpanel and Centos 5.7. I checked almost in every forum and i cannot come up with a solution (i guess i am the only one with this problem). Could you check if in the file /etc/ppp/options.pptpd the “name” option matches the second field in /etc/ppp/chap-secrets entries? The two fields with the word “pptpd” must match. im keep getting errors, would you please be able to help me set this up? Sure, just paste me the errors you’re getting to pastebin and i’ll see what I can do. i install and configure PPTPD on centos server and i can connect this too , but i want to browse internet through my server. how i can?!! If you’re on Windows, you need to check the “Use default gateway on remote network” check box in your TCP/IP Settings. i have checked the option but still unable to browse internet. i install and configure PPTPD on centos server and i can connect this too , Further under connection, i have checked use default gateway but still it is not browsing via vpn. Can you please tell me what else i can do or how can i test what is wrong. I have tried reinstalling as well but still same. Do you have csf installed? Can you try connecting with csf disabled (csf -x)? I can only imagine it’s a firewall issue, or the net.ipv4.ip_forward entry under /etc/sysctl.conf hasn’t been applied. When you connect to the VPN can you ping 10.22.222.1? How about 208.67.222.222? Are you sure forwarding is enabled on your cPanel server? and then run sysctl -p to apply the changes. Get Error 619 : Could not connect because port was closed. Now even with csf enabled, it did connect before and now giving this error. Before it was connecting but there was browsing issue. Is there any permanent fix ? Amazing tutorial, George thanks, one question though, everything worked just fine after refreshing csf, got out of testing mode, all was good, ldf was loading, everything seemed fine, until the server decided to stop working, i dont know what the issue is, but it seems to work for a while after i restart cpanel and csf… any ideas? Hey, when I tried to connect with Win 7 I got error 800. How do I view the PPTPd error logs? Ok, can connect now, but client has no network access??? Have you ticked the “Use default gateway on remote network” checkbox under your VPN connection’s properties? Can you install a PPTP VPN package on any VPS? What I mean do I need to ask my provider beforehand. One last question would affect any of the hosting accounts on my VPS? If your VPS is running on OpenVZ virtualization, your provider needs to have TUN/TAP active and working for VPN to work. Usually you need to open a ticket with them in order to enable it. Hi George, this looks like a great guide! Was wondering if you can help me, I’ve been spoiled with all my other servers being on windows server 2008 so it was always very simple. I’ve never used cent before so I have no clue of how to even begin to connect to my new dedicated server I just bought with CentOS 6 and CPANEL. I can only get internet via vpn with my first connection. For example, if i connect with my desktop (user1) and then another computer (user2) i can access the vpn server but from user2 i can only see the server. Nothing else on the internet. Also tried to change localip to one ip only, but same problem. Interface is working fine, one user gets 192.168.9.110 with remote 192.168.9.210 and next user 111 with 211. Anyway, if you have time, drop me a line. Thanks for your kind words 🙂 Nothing comes up on top of my head atm, but just to be sure, can you ping user1 from user2? Have you tried pinging an internet IP from user2 (just in case it’s a DNS issue) eg. 8.8.8.8? Yes, i tried it. It’s not a dns issue. i install and configure PPTPD on my server and i can connect this too , but i want to browse internet through my server. how i can?!! I know this post is old, but I set up a PPTP VPN on my CentOS 6.5 VPS running cPanel and can connect to it via VPN, but all traffic except for the IP of the VPS itself is being blocked. I am running CSF on the VPS, and even disabling it doesn’t seem to help. Any thoughts/ideas? Thanks! Are you sure you have enabled IP forwarding in /etc/sysctl.conf ? Also, even with CSF disabled, CentOS has it’s own set of (default) rules. You might want to try flushing all iptables rules (iptables -F && iptables -X) and try again. how to solved this problem? It works to connect but it doesn’t get the default gateway from it after connecting, despite following the guide, is there a step missing?